Background Ankylosing spondylitis (AS) is a chronic inflammatory disease primarily affecting the axial skeleton, including the sacroiliac joints, costovertebral joints, and the spine. Patients with AS found to have an alter gait pattern. The purpose of this study was to investigate biomechanical alterations in gait after surgical correction in a patient with severe kyphosis from AS. Methods A case report in controlled laboratory study, a pretest-posttest design. A 20 year-old male presented with severe sagittal imbalance and inability to stand erect due to AS. He presented with thoracic kyphosis of 70°, lumbar kyphosis of 25°, and pelvic incidence of 43°. The patient had a complex spinal reconstruction with 84° of sagittal correction, normalizing his sagittal alignment. Gait analysis was performed the day before surgery and one month post surgery, including three-dimensional kinematics, ground reaction forces, and electromyography outcomes. Results Normalization of spinal alignment minimally increased walking speed and cadence. Lower extremity ranges of motion angles increased, but were not symmetrical even one month post surgery. Postoperatively, trunk flexion, neck extension and head orientation angles decreased compared with preoperative values, but was not symmetrical even one month post surgery. The trunk muscles were activated earlier in the post surgery condition compared to the pre surgery condition while lower extremity muscles presented later muscle activation. Conclusions Surgical correction of spinal alignment improved spine function and efficiency. Changes in gait abnormality parameters observed imply that the patient used less energy to ambulate after surgery than before surgery. Although pre-surgery data showed compensation in the spine kinematics, post-surgery data supported significant changes in the spine and the lower extremity values. 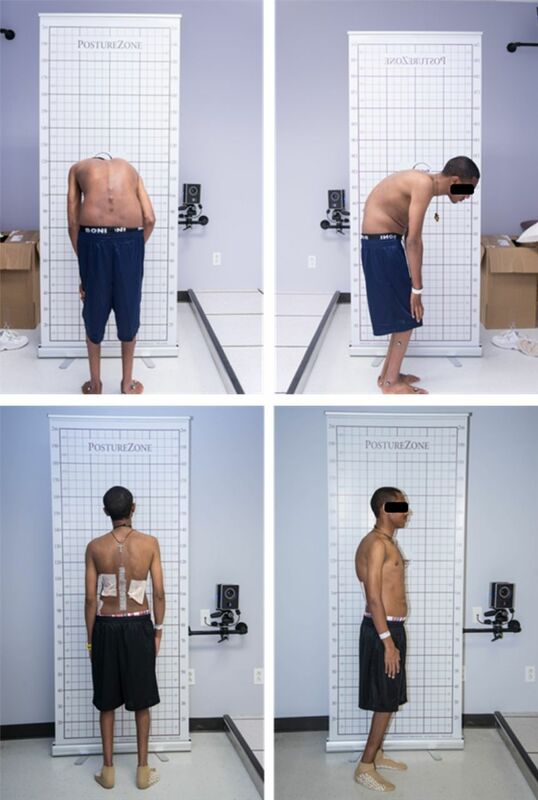 Clinical Relevance Formal gait and motion analysis can provide a method to assess the impact of severe spinal deformity on function and changes after treatment. Patients with AS were found to have an altered gait pattern. Zebouni et al.2 compared the gait pattern of patients with ankylosing spondylitis to healthy controls. Those AS patients presented less hip and knee range of motion and reduced stride length. Similar results found by Del Din et al.11 who presented reduced in gait velocity and stride length, alterations in the sagittal plane at trunk, pelvis, hip, knee and ankle for AS patients. De Filippis et al.12 explored the muscle activation pattern in gait in AS patients. They found that the timing of activation of the tibialis anterior results prolonged while the timing of activation of the gastrocnemius medialis results delayed which may lead for a gait strategy that confers greater stability but limited power in AS patients. A 20 year-old male presented with severe AS, resulting severe sagittal imbalance and inability to stand erect. The patient had a 10 year history of progressive kyphosis and spinal stiffness. The patient had complete spontaneous fusion of his thoracic and lumbar spine, but had cervical spine mobility (Figure 1). The patient had complete spontaneous fusion of his thoracic and lumbar spine. He had cervical spine mobility. His deformity was associated with back pain and difficulty with horizontal gaze. He used a stick to ambulate, and would support his trunk with his hand on his thigh during gait. He had no history of other medical problems, injury, tuberculosis or surgery. On physical examination, he had severe kyphosis of the thoracic and lumbar spine, and was neurologically intact. He had negligible coronal imbalance. He also had moderate hip osteoarthritis with hip and knee flexion contractures. Pulmonary function testing revealed significant restrictive lung disease with reduced lung volumes, due to his deformity combined with ankyloses of his rib cage from ankylosing spondylitis. He had thoracic kyphosis of 70°, lumbar kyphosis of 25°, and pelvic incidence of 43°, measured on radiographs made in the sitting position preoperatively (Figure 2). Pre (sitting) and post (standing) surgery radiographs. The patient had a complex spinal reconstruction done in 3 phases over 14 hours under a single anesthetic. Phase 1: T11-L5 laminectomy with osteotomy at each level from T11-S1. This involved cutting the posterior bony elements of the fused spine at each level in order to segmentally “un-fuse it”. Pedicle screw fixation points were placed in the thoracic, lumbar and sacral spine. Iliac fixation screws were placed. Phase 2: Anterior release and lumbar interbody fusion of L4-5 and L5-S1 using hyper-lordotic cages and autogenous bone graft, as well as anterior release of the L3-4 anterior longitudinal ligament and annulus preformed from the left side. Phase 3: Final posterior correction of the lumbar spine with completion of the L3-4 Smith-Peterson osteotomy, compression of the multiple osteotomies, rod placement from T5-Pelvis, and autogenous bone graft placement T11-sacrum. A total of 84° of sagittal correction was achieved (Figure 2). The effect of complex spinal reconstruction on AS patients13–16 and their gait pattern2,7,12 are well documented. However, there is limited literature on whether complex spinal reconstruction effects on spine and lower extremity neuromuscular control and biomechanics during gait in patients with AS. The purpose of this study was to investigate biomechanical alterations in gait after surgical correction in a patient with severe kyphosis from AS. A case report in controlled laboratory study, a pretest-posttest design was used in this study. Gait analysis was performed the day before surgery and one month post surgery (Video 1 & Video 2; Video 3 & Video 4). Fifty-one reflective markers (9.5 mm diameter) were incorporated to collect full body three-dimensional kinematics using 10 cameras (VICON, Denver, CO) at a sampling rate of 100 Hz. A static trial was then collected to note marker placement. Ground reaction forces (GRFs) were measured at 2000 Hz using three parallel force plates (AMTI, Watertown, MA). Electromyography (EMG) data from Erector Spinea (ES), Multifidus (MF), External Oblique (EO), Internal Oblique (IO), Rectus Femoris (RF), Semitendinosus (ST), Medial Gastrocnemius (MG), and Tibilais Anterior (TA) were measured using preamplified surface electrodes (Delsys Inc, Boston, MA) at 2000 Hz. The EMG sensor signal bandwidth was 20 to 450 Hz with a 3 μV peak-topeak baseline noise. The overall channel noise was less than 0.75 μV with a common-mode rejection ratio less than 80 dB. Each EMG sensor had 4 contacts with 5 mm by 1 mm dimensions and each contact was made of 99.9% silver. The skin was cleaned with alcohol, shaved as necessary, and then lightly abraded to reduce impedance. The patient walked barefoot at his self-selected speed along a 10 m walkway. At least 5 trials were recorded during each session. Scaled and transformed 3D motion capture marker data, and scaled EMG data were exported from the Vicon Nexus system and imported into a custom Matlab (Mathworks Inc., Natick, MA) program for processing. Marker coordinate data were smoothed using a fourth order no-phase-shift low pass Butterworth digital filter (6 Hz cutoff ) and used to calculate joint angle time series data for the hip, pelvis, spine segments and head.8 The EMG data were band-pass filtered between 20 and 450 Hz with a fourth order nophase shift Butterworth band pass digital filter. The EMG timing data were presented as percentage of gait cycle. Gait cycle define as the time period of movements in which one foot contacts the ground to when that same foot again contacts the ground, and involves forward propulsion of the centre of gravity. The ground reaction force (GRF) data were not filtered during post-acquisition processing. Clinical gait analysis parameters were calculated from kinematic and kinetic data: spatiotemporal parameters, joint angle values at a specific instant of the gait cycle, peak GRF and time to peak EMG activity (Table 1). 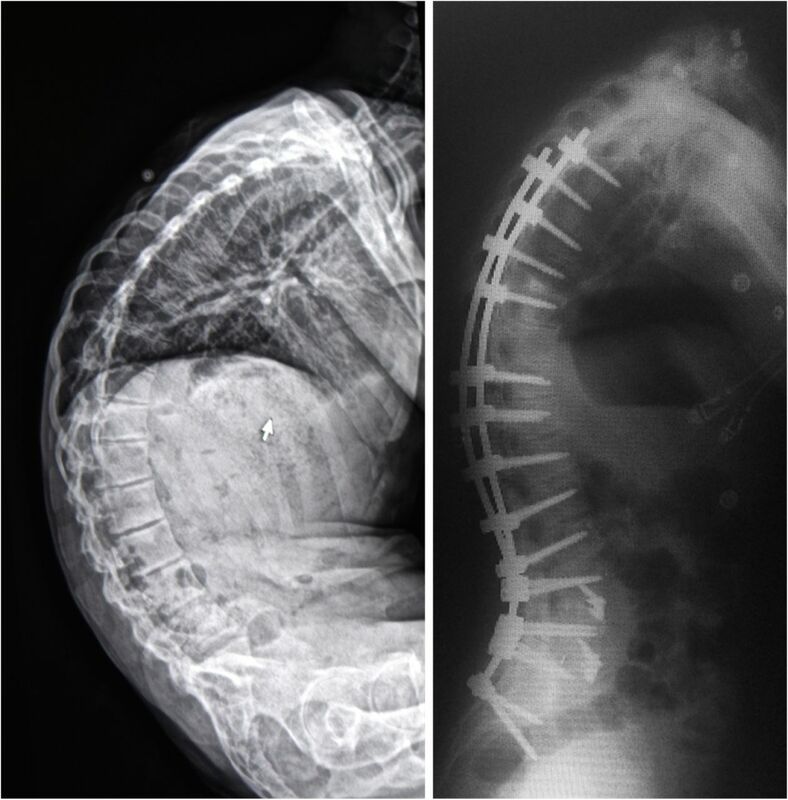 Overall, surgical correction of severe kyphosis improved the patient’s gait performance and efficiency (Figure 3). Normalization of spinal alignment minimally increased walking speed (0.02 m/s) and cadence (4 steps/minute), but did not change step lengths (Table 2). Trunk flexion decreased (63°) along with neck extension (19°) and head orientation (43°) angles at initial contact (Table 2). Lower extremity range of motion (ROM) increased, but was not symmetrical even one month post surgery. Bilateral hip (R 10°; L 2°), left knee (9°) and bilateral ankle (R 5°; L 30°) ROM increased during the stance phase while right knee (11°) ROM decreased compared to the pre surgery condition (Figure 3 & Figure 4). Pre surgery data showed, the majority of body compensation for the tremendous trunk flexion came from the neck and head and less from the lower extremities. Ground reaction forces (GRFs) were decreased (R 21N; 29N) post-surgery (Table 2). Gait Parameters, Kinematic, Kinetic and EMG variables Gait (mean± SD). Sagittal plane excursions of the pelvis, hip, knee and ankle pre- (red) and post- (blue) surgical spinal alignment for a patients with severe ankylosing spondylitis in comparison the healthy values (gray). Lower extremity range of motion sagittal plane during the stance phase. Positive flexion / plantar flexion. Pre - One Day before Surgery, Post - One Month after Surgery. 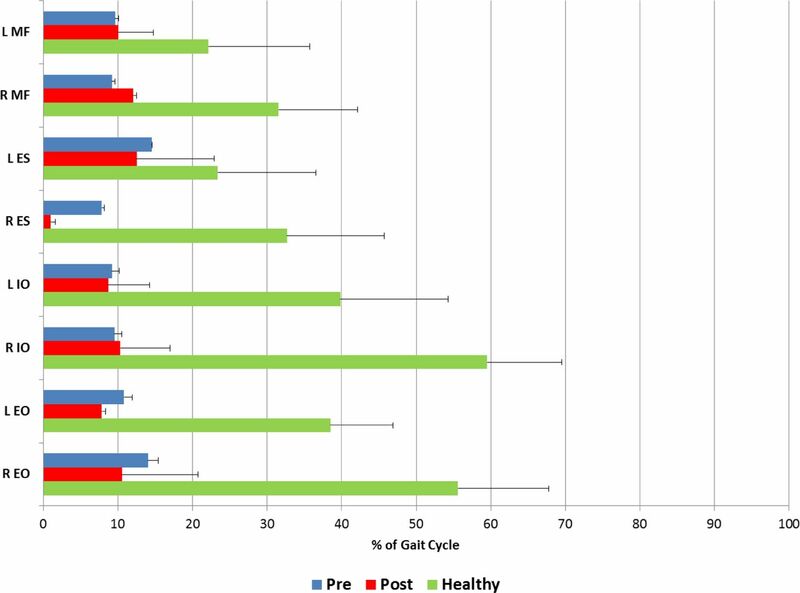 Trunk muscles (R ES 7% of gait cycle, L ES 2%; R EO 4%, L EO 3%; R IO 1%, L IO 1%)) were activated earlier post-surgery compared to pre surgery (Figure 5). Multifidus does not present a significant different activation post-surgery compared to pre surgery (Figure 5). Post surgery trunk muscle activation presented with high variability in the data. 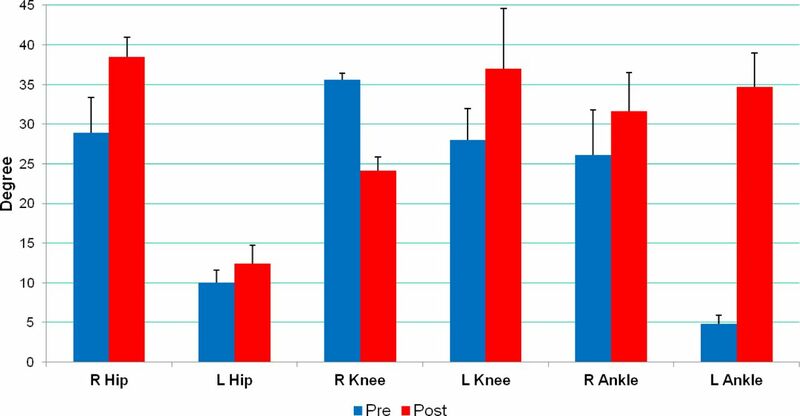 Lower extremity muscles (R RF 8% of gait cycle, L RF 50%; R ST 3%, L ST 53%; R MG -1%, L MG 44%; R TA 5%, L TA 25%) were activated later on the stance phase postsurgery compared to pre surgery (Figure 6). Lower extremity neuromuscular control was not symmetrical even one month post surgery. Trunk EMG time to peak. Time for muscle to reach its peak activity as a percentage of gait cycle. 0% represents right heel contact. EO - External Oblique, IO - Internal Oblique, ES - Erector Spinae, MF - Multifidus, Pre - One Day before Surgery, Post - One Month after Surgery. Lower Extremity EMG time to peak. Time for muscle to reach its peak activity as %gait cycle. 0% represents right heel contact. RF - Rectus Femoris, ST - Semitendinosus, TA -Tibialis Anterior, MG - Medial Gastrocnemius. Pre - One Day before Surgery, Post - One Month after Surgery. The purpose of this study was to investigate biomechanical alterations in gait after surgical correction in a patient with severe kyphosis from AS. Overall, surgical correction of spinal alignment improved lower extremity function and trunk muscle efficiency. Although gait parameters did not significantly improve, trunk and lower extremity kinematic dramatically improve due to surgical correction. 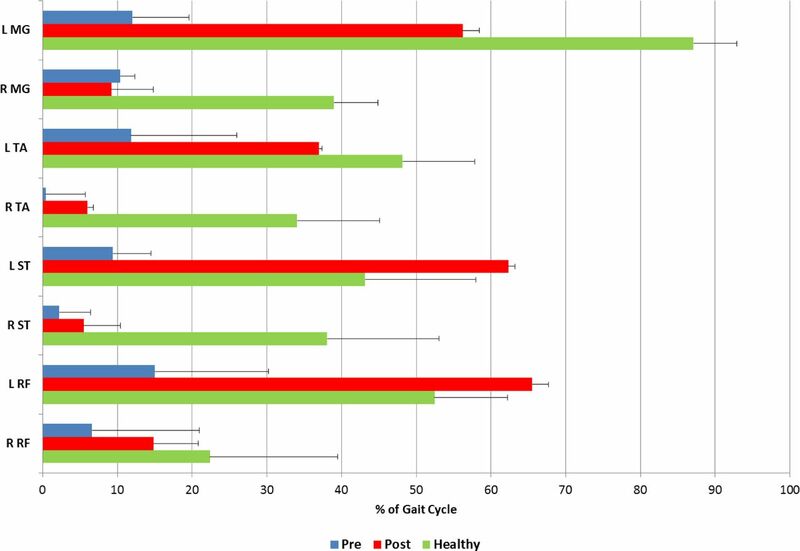 Our results Clinical gait analysis reveals significant different before and after spine surgery when impending to a normal gait values (Figure 3). The patient appeared to leaning slightly to the left and flexed while demonstrating more right knee flexion contracture than the left preoperative (Video 1 & Video 2). To maintain this posture preoperatively, he may be ranging his left knee less than the right. The right knee ROM may have decreased postoperatively due to the correction in the coronal plane (Video 3 & Video 4). After the coronal correction, his left knee would require a greater degree of extension to maintain the balance while the right knee would require less range of motion to maintain this stance. This may explain the increase in the right ankle ROM to compensate for the less ROM of the right knee and the increased ROM of the left ankle to compensate for the persistent decreased ROM of the left hip, most likely due to the hip flexion contracture. Left side approach was used for the anterior release; this may explain the postoperative decrease in the left IO and EO. Changes in gait parameters observed imply that the patient used less energy to ambulate after surgery than before surgery17 based on the EMG activity, joint kinematics and GRF data. The delay in lower extremity muscle activation during the stance phase can be attributed to the decrease in demand in activation of these muscles compared to the kyphotic posture in which they are activated earlier to maintain the trunk control. The decrease in GRF also is the result of more efficient gait and increased speed. While pre-surgery data showed compensation was in the spine only, post surgery data supported significant changes in the lower extremity values. Although surgical correction of spinal alignment presented significant improvement in trunk and lower extremity neuromuscular control and biomechanics, asymmetrical gait pattern was still presented even one month post surgery. Formal gait and motion analysis can provide a method to assess the impact of severe spinal deformity on function and changes after treatment. Furthermore, gait analysis data may be used by therapist to facilitate post-operative rehabilitation. The information presented in this paper can be valuable in supporting the enhance quality of life and function that can occur in these complicated and challenging patients. The authors report no relevant disclosures or conflicts of interest. (2015) Long-term safety and efficacy of infliximab for the treatment of ankylosing spondylitis. Ther Clin Risk Manag 11(3):1719–1726. (1992) Gait analysis in ankylosing spondylitis. Ann Rheum Dis 51(7):898–899. (2015) Gait behaviors as an objective surgical outcome in low back disorders: A systematic review. Clinical Biomechanics 30(6):528–536. (2015) Gait Analysis in Cervical Spondylotic Myelopathy. Asian Spine J 9(3):321–326. in Research into Spinal Deformities, Gait in adolescent idiopathic scoliosis. Kinematics, electromyographic and energy cost analysis, eds Carl-Eric Aubin IAFS, Hubert Labelle, Alain Moreau 7, p 1582010. (2015) Has a Mono- or Bisegmental Lumbar Spinal Fusion Surgery an Influence on Self-Assessed Quality of Life, Trunk Range of Motion, and Gait Performance? Spine (Phila Pa 1976) 40(11):E618–626. (2015) Pelvic and Spinal Motion During Walking in Persons With Transfemoral Amputation With and Without Low Back Pain. Am J Phys Med Rehabil. (2016) Effects of Volitional Spine Stabilization and Lower Extremity Fatigue on Trunk Control During Landing in a Recurrent Low Back Pain Population. The Journal of orthopaedic and sports physical therapy 1:1–23. (2013) Research methods in Biomechanics (Human Kinetics, Champaign, IL). (2016) Effects of Volitional Spine Stabilization on Lifting Task in Recurrent Low Back Pain Population. European Spine Journal. (2011) Impaired gait in ankylosing spondylitis. Med Biol Eng Comput 49(7):801–809. (2006) [Muscle activation patterns and gait biomechanics in patients with ankylosing spondylitis]. Reumatismo 58(2):132–137. (2010) Discovertebral (Andersson) lesions in severe ankylosing spondylitis: a study using MRI and conventional radiography. Clin Rheumatol 29(12):1433–1438. (2008) Surgical management of symptomatic cervical or cervicothoracic kyphosis due to ankylosing spondylitis. Spine 33(16):E559–564. (2005) Orthopaedic management of ankylosing spondylitis. The Journal of the American Academy of Orthopaedic Surgeons 13(4):267–278. (2015) Comparison of Smith-Petersen Osteotomy and Pedicle Subtraction Osteotomy for the Correction of Thoracolumbar Kyphotic Deformity in Ankylosing Spondylitis: A Systematic Review and Meta-analysis. Spine 40(8):570–579. (2014) Aging, motor skill, and the energy cost of walking: implications for the prevention and treatment of mobility decline in older persons. J Gerontol A Biol Sci Med Sci 69(11):1429–1436.